“When I interviewed David over a year ago for his position, the question to me wasn’t whether he was able or qualified to do the job; of that, I had no doubt. It was more about whether I was qualified and able to supervise and properly instruct him,” says Mark Fink – Hebrew Public’s Chief of Staff. David is an Adelphi University graduate, with a major in English Literature from the Honors College. 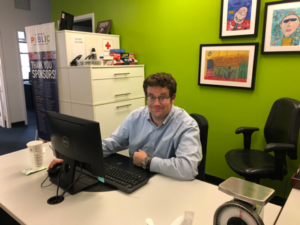 He was hired through JCC Manhattan last year to fill the role of operations assistant at Hebrew Public’s office in New York City. 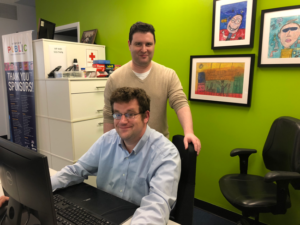 At Hebrew Public, part of the mission is to lead a network of diverse public charter schools that teach Modern Hebrew and the history and culture of Israel to children of all backgrounds. Hiring David and being accepting and open to his disability, means a lot to us. Our classrooms are filled with students from different backgrounds, religions, and socioeconomic classes. Fifty percent of our students are students of color, 34% speak a language other than English at home, and 44% are economically disadvantaged. Furthermore, social and emotional skills are taught in our schools – these skills encompass empathy, responsible decision-making, relationship skills, and social awareness. Opening our doors to diversity is part of what we stand for as an organization. In today’s society, organizations need to make an effort to raise awareness to accept those with disabilities in the workplace. Regrettably, there are more than 14 million people with disabilities who want to work. The challenge is breaking down those misconceptions that that employee will underperform. Despite these challenges, we do believe that significant progress has been made. With the notion in mind, that everyone deserves a chance regardless of their condition, and a vision for inclusion, JCC has created The Jack and Shirley Center for Special Needs program. Their programs for children and adults aim to build and nurture individuals with special needs through social, recreational, and educational activities. With their support and expertise, families feel empowered, and most importantly, included. “Truth be told, my experience with him isn’t much different from my experience with anyone else who has worked with or for me.” David is actually most productive when given clear instruction and left to his own devices. He manages himself effectively and isn’t shy about asking when something is unclear,” explains Mark. 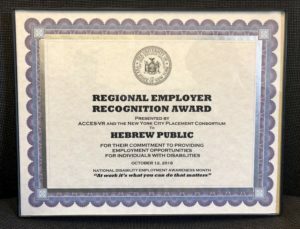 In honor of National Disability Employment Awareness Month, Mark was nominated as an exemplary employer and received an award on behalf of Hebrew Public for committing to providing employment opportunities to individuals with disabilities. Every year, the Adult Career and Continuing Education Services-Vocational Rehabilitation (ACCES-VR) of the New York State Education Department holds an awards breakfast in honor of National Disability Employment Awareness. The goal is to spread awareness of employment needs and contributions of individuals with all types of disabilities.